John Leahy will retire in January and stay for a short transition to help his successor, Eric Schulz, who was named EVP, Chief of Sales, Marketing and Contracts. Leahy is Chief Operating Officer-Customers. During his three-decade long tenure at Airbus, the company moved from a single-digit market share to surpassing Boeing for more than a decade in sales. Leahy spoke with LNC about his retirement. John Leahy, right, with William Franke, CEO of Indigo Partners at a history-making deal for 430 A320neos, announced at the Dubai Air Show. Photo via Google images. Nov. 28, 2017, © Leeham Co.: John Leahy was a salesman at Piper Aircraft, a small general aviation aircraft producer when he received a call from a headhunter to join Airbus North America as its top salesman. Leahy was head of marketing at Piper. With a pilot’s license, he would take various Piper aircraft to conventions or air shows and on sales calls for demonstration. Before moving, the headhunter called. John Leahy in his early years at Airbus. Seattle Times photo via Google images. like military guys who go over there and say they lived three years in Europe,” Leahy says the headhunter told him. “They didn’t live in Europe at all. They lived in an American air base,” the headhunter said. The headhunter said Leahy should work for a European company if he wanted a European experience. “I thought that sounded intriguing,” Leahy said. The short-term irony, of course, is that he was hired by a European company, Airbus, working in America—initially in New York City at Rockefeller Center and then in Herndon (VA), a distant suburb of Washington (DC). That was in January 1985. Leahy worked out of Herndon until the summer of 1994, eventually rising to president of Airbus North America, when he and his family transferred to Airbus headquarters in Toulouse, France, as head of commercial for Airbus Worldwide. Leahy now holds the title of Chief Operating Officer-Commercial. The positions above that are president and COO or CEO of Airbus or of what used to be known as Airbus Group. These positions were traditionally held by French or German nationals until a few years ago when Tom Williams, a UK citizen of Scotland, was named president and COO of Airbus commercial. One person close to Leahy once quoted him as saying he held the wrong passport (American) as the reason why he wouldn’t become president. Making the pitch to Northwest presented Leahy with a special challenge, he recalls. No carrier in the US had ordered the A320. Breaking precedent was a problem. The safest bet, he said, was always going with Boeing. Then Leahy sold the A320 to United Airlines. Boeing offered the 737-400 in the competition. Impartial observers noted that the -400 was slower and shorter-ranged than the A320. Secure in the assumption the Boeing-only operator United wouldn’t stray, the order from Airbus indeed prompted Boeing to redesign the 737 into the Next Generation. The 737-800, the successor to the -400, was given a new wing and 12 more seats than the A320. Generally, it’s agreed that the -800 has a better seat-mile cost than the A320 (before later improvements). Leahy subsequently sold the A300 to American and Continental airlines. Selling the A300-600s to American required some innovation. American’s wide-body fleet was principally the DC-10-10/30 and 767-200/ER. Boeing pitched the new 767-300ER against the A300. The CEO, Bob Crandall, was the hard-charging, cost-focused executive at American but the CFO, Jack Pope, and his lieutenant, Gerard Arpey, were tough negotiators. Pope negotiated walk-away leases for 25 A300-600s, shocking Boeing (and the industry). The deal allowed AA to return the airplanes after a specified period at little or no penalty. Pope then turned around and negotiated walk-aways with Boeing for a similar number of 767-300ERs. The deals were extremely rare but not unheard of. McDonnell Douglas did five-year walk-aways for American’s first deal for MD-80s, a deal that ultimately led to American buying hundreds of MD-80s. Before Leahy, Airbus had literally loaned four A300B2 to Eastern Airlines for a test run. This led to an order for what was then a large number of aircraft. These deals all paid off. American kept the 25 A300s and ordered 10 more. American also bought a large number of -300ERs. Airbus was willing to make high-risk deals to gain market share. Not all turned out well. One was with Pan Am. When Leahy came on board Airbus, Pan Am had ordered the A300 and A310 but the contracts weren’t completed. Leahy wrapped these up. Pan Am ordered A320s to replace its aging Boeing 727-200s used to feed its New York and Miami hubs, but neared collapse before taking delivery. Leasing company GPA purchased the contract and began leasing the aircraft to Braniff II. Braniff took delivery of about six before it collapsed. Then the contract and aircraft were assigned to America West Airlines. America West later went through bankruptcy. Airbus provided some exit financing. AWA later acquired US Airways, also an A320/A330 customer, becoming the largest operator of Airbus aircraft in the world. AWA adopted the US Airways name. It later acquired American Airlines, taking American’s name. American by then ordered some 400 A320 family aircraft to replace its aging MD-80s. So, it all worked out in the end. One Leahy deal that didn’t turn out well was selling nine A310-300s to Delta Air Lines after Delta acquired the type with its purchase of Pan Am’s European assets, including airplanes. These also had walk-away provisions. Delta exercised them in a massive cost-cutting program under then-CEO Ron Allen during the 1990-91 airline industry disastrous period in which 40% of the US seating capacity was operating under bankruptcy. Delta avoided following other airlines into Chapter 11 then, but those nine A310s Leahy sold Delta were returned in the process. All the Pan Am Airbuses were disposed of. The reason Delta would buy another Airbus aircraft was a controversial set of deals Boeing struck, first with American, then with Continental, Delta and United. These were, for the time, unprecedented exclusive supplier contracts to eliminate competition and bind the four airlines to buying airplanes in their categories only from Boeing. Leahy and Airbus were taken by surprise by the first, the American deal. “I said, ‘you must be joking. Why would any company eliminate competition going forward?’” Arpey didn’t have an answer, Leahy said. Boeing went ahead and signed similar 20-year exclusive deals with United, Delta, Continental and Southwest, Leahy said. The European Union had to review the merger between Boeing and McDonnell Douglas three years later and found the agreements to be illegal. Boeing agreed to abrogate the agreements, but one CEO—Crandall—years later acknowledged he did a side letter agreeing to honor the terms. It’s likely the other airlines did, too. United didn’t buy an Airbus airplane again until Glenn Tilton was CEO and ordered the A350. Delta stayed true to Boeing until 2013—about 20 years. Continental remained an exclusive Boeing customer and, except for playing with the A350 orders and ultimately upping them to 45, United has remained exclusively Boeing. United is now populated by Continental management, following its acquisition of United. Airbus won the next round for the A321ceo. Delta since reordered the 737-900ER and the A321ceo, buying more than 100 of each. The airline is running a competition between the A321neo and the 737 MAX. A decision is due next month. FWIW, the European Union threatened to fine the enlarged Boeing Company by up to 10 percent of annual revenue for failing to comply — essentially blocking EU airlines from using Boeing aircraft. Excellent article and interesting read. I think no one can deny Leahy’s influence on the industry. Flying the 777/787 I have to admit I am a bit Boeing biased, but even I am somewhat shocked reading about Boeing’s exclusivity deals, which in a way reminds me of the current situation with Bombardier: Boeing is trying to push out a superior product with dirty (unfair) tactics. Boeing will obviously not even take note of this type of sentiment. Aside from the Airbus-Bombardier tie up do you think this attitude might backfire on Boeing in the future? According to Boeing, the Boeing Company is apparently rightfully entitled to as large a market share in the LCA business as they held by the early 1980s (i.e. a nearly 80 percent market share). The long-held view in Seattle seems to be that Boeing only lost their dominant position in the market because; 1), the other guy was cheating and 2), that the playing field has not been level since then — never mind that there’s never been anything close to a perfectly competitive, distortion-free market when it comes to LCA manufacturing. In the LCA market, governments have consistenly been subsidising production of their OEMs, then lobbying other governments to buy their planes. The US in particular has often been linking these procurement decisions using strong-arm tactics in their diplomatic relationships with other countries — and who was talking about a “level playing field”? Nick: I think its all about dirty tactics and unfair deals. As was pointed out to me, the articles in Das Spiegel are well worth reading. RR getting fined 800 million for bribes is worth noting as well. In the end I don’t know if the US firms are better at hiding that or figured out it did not pay after the Lockheed scandal. My conclusion is that integrity is only for the peasants, everyone else gets to play the game. There’s only one John Leahy. Godspeed in the next phase of your life. I used to detest Leahy and to love Boeing. Now it’s the other way around. Having had to deal with aggressive NY personalities like Leahy I don’t like them. note: I have also dealt with some very nice people from NY, but the bad ones are really a class unto themselves. See current US POTUS. Its looking like there is good amount of egg on both side of the fence. In the end its really the company culture that is relevant. The fact that a brash New Yorker fitted so well, and for so long, in the Airbus cultural environment is a small miracle. I remember this very well. I read about it at the time in Aviation Week. It’s the kind of move that slowly, but surely, eroded my faith in Boeing. They played dirty then, and they still do. Normand: Companies have always done what they could. If I was Boeing I would do an exclusive if I could pull it off as well. Cowering worker comments show the utter disdain the management has (and tries to hide in most cases) of the workers. The view is the management is the company and you just replace the parts. There are companies that do value the workers and try to balance the corporate future , shareholder and the employees as all essential to long term success. The economy benefits vastly more from a new aircraft with all the employees hired, vendors supplier mfg and the ripple affect goes all the way down to the gas station. Yes, agree on this. Share buybacks are really distorting the future of a company in the vast majority of the cases. Look at IBM after 20+ years of financial engineering. Is Watson all they could innovate really on? If Boeing can use the American justice system to kill a competitor using easily refutable arguments it is more than corrosive, it is simply corrupted. The US justice system is a partner in crime for large American corporations. “If Boeing can use the American justice system to kill a competitor using easily refutable arguments it is more than corrosive, it is simply corrupted. Well said Normand- this is how I and most of world now view the US. The Boeing senior management is just displaying the type conduct that led directly to the GFC – it does not reflect well on the US and certainly won’t in the long term ‘make America great again’ despite what Trump says. Of course, luck played a role. Yet, folks such as John, are true icons. Having helped nursed/steered in his own way such a global company is astonishing. Perhaps not as celebrated as recent entrepreneurs who built empires seemingly in no time but comparable to me to folks like Bezos… who at the end have been ‘at it’ for close to 25 years now. It takes time. They are builders. Hat’s off! I don’t equate a sales man with people who brought a company up from scratch like Mursk. They are valuable to a company but they are not the company. No one is the whole company. After 3-5 people, it’s the team that matters. Sure a leader makes a big difference. But the team makes it happen. Good luck to Leahy, what a fantastic job he’s done for Airbus. The massive problem Airbus has now is another frenchman on the top board, the french have slowly increased to number of french in top jobs now. The french cannot manage, they are process driven,it’s proven, the only reason Airbus have been so successful is the german precision, the British pragmatism and flexibility, the spanish work ethics and the french ??????? Airbus is going to be a citreon, peugeot company which fails miserably………………….just wait! A measure of the man is that he did it all surrounded by Frenchmen and as far as I recall he does not speak French. Typical American, won’t learn the language of the company he works for. I always admire Greg Lemond (sp) he raced in Europe and the Tour De France was the star event and he understood that learning French was a key part of being part of that community. Leahy reminds me more of Lance Armstrong. Europe is better equipped this way. Will it matter to them? Seems share buybacks are more in vogue. One day, you’ll miss the French: e.g., the Chinese are at our doorsteps. They have in fact already started to enter our homes. Look around…for the homes contain what they did already build. This being what we did not build. See where what we buy every year comes from? (i love though the euphemism ‘designed in California’… history tells us that where it’s made is where the puck’s going). Wait a few more years for additional shocks (coming probably even sooner than we thought given how well organized we are during this 4 years cycle). You’ll love the French then. Good luck to AB. It takes a team to achieve great things. I root for the “newbie”. Then U are rooting for the wrong team. Airbus ceased to qualify as a “newbie” in the mainline commercial aircraft(i.e. 100seats or more) industry over a decade ago when 380 entered service(i.e. a product line as complete as Boeing’s), 320Ceo family achieved or exceeded 737NG family in terms of both mkt share in backlog+deliveries, more 330/340 delivered than 777(despite both had EIS within about 2yrs of each other), etc. To root for a true newbie in the mainline aircraft mkt today, U need to be standing behind either Comac, BBD or EMB….even Irkut don’t qualify as the Russians hv been in it since the Soviet era. As much as we may grouse about EU, France and Germany etc, at least a lot of us understand that they are democracies and we have vastly more in common with them than China or Russia. We may compete, we do not want to destroy each other. Granted the POTUS does not, but then as quote by Tillerson and never really denied, he is a moron. But the French were wise enough to let a German run production and an American to look after sales. They might not be able to manage but they are smart. They also have an incredibly well managed nuclear programme despite all the problems associated with this technology. Their TGV system is also well managed and works better than fine. CERN is another French initiative. A very successful European organization that beat the Americans at their own game: particle physics. What made France so successful on large technology projects is the will, the determination and the vision, which were all lacking in Britain in the 70s. In the 50s the French asked their European counterparts to form one big country that could become the United-States of Europe. Then in the 60s they asked them again to form one big aircraft company called Airbus. And yet again in the 70s they asked them to form a European NASA based on a European booster. The French might not be very good managers but they managed to do quite well on a variety of large-scale French-led initiatives. But we still await, I think, President Macron declaring (en Francais, of course): “La belle France first, la belle France only, la belle France always…”, whether or not standing at an FAL in Toulouse. You understand that Britain is leaving Europe, right? They are the only ones. They speak some form of (old?archaic?) English. Our English vernaculars are winning worldwide. Not theirs. Of course, ethnically, we can be a bit hard to understand sometimes for the high class in London. Then again they fly in Dassault private jets. Air France’s management has always been very found of Boeing products and they only bought something from Airbus when they were told to do so. Today they proudly fly the Dreamliner and they have a vey well balanced fleet. How long did it take for British Airways to buy from Airbus? The situation was similar in Britain until the Marché Commun was created and then something terrible happened: the British turned their back on the Europeans and decided to deal with the Americans instead. Which meant abandoning the Rolls-Royce RB-207 for the Airbus A300 and pushing the development of the RB-211 for the Lockheed L-1011. Their tergiversations around Airbus was just a rehearsal for Brexit, and that was before they had even joined Europe! France has always been pro-Europe as long as it served their interests. And most of the time it certainly did. On the other side of the Channel Britain was always anti-Europe and pro-American because they thought it would better serve their interests. And most of the time it never did. I suppose he must have been at Lock Haven (PA) to have declined the Florida move… Is there a second part with his reflections on selling Airbus elsewhere than just in the U.S. (please)? I guess he was afraid of crocodiles. But today there are only a few left and the biggest specimens are to be found in Chicago. No, that is the Republicans! An excellent story on J.Leahy and I’m particularly intrigued by the detailed recounting of the sales history of him(and also Airbus by default) in the U.S. mkt. I never expected the Pan Am deal for 320 x16 which looked really bad for Leahy/Airbus circa 1990 was somehow connected to the 320 family x492(in service plus on firm backlog) @ AA today thru so many twists & turns over 3 decades. Obviously Leahy faced a US market that was far from from a free market economy. Other things were more important. Obviously the rest of the world was big enough to stear Airbus towards the strong position it in now. Loved Dubai, everybody (Reuters, Seeking Alpha, Bloomberg) dancing around the fire on how Airbus is going down & Boeing taking over, EK 787-10 transformational deal, Airbus management fleeing the site etc. etc. Then John calls together a small press conference on day 4.. they should have known after 30 yrs.. I think its being forgotten that a good part of early Airbus success was Asia with the A300 and the lack of regulations that allowed them to fly long distance flights over water with twin engines. I don’t think so. I think this Leehamnews.com story is about J.Leahy and naturally, its focus would be on how he got connected with Airbus @ the beginning and his early role+achievements for Airbus which were specifically the N.American mkt. Very true(but more so in E.Asia). But early success of that product in that region during the late 70s & 80s had nothing to do with J.Leahy. Absolutely untrue. In terms of rules re twin-engine ops over water, Asia-Pcf regulatory regimes hv always been as strict as FAA or EASA(In fact, many rules are often a mirror image/copy of the FAA/EASA version). In a nutshell , the main reason why A300 is legal on so many routes within E.Asia is geography, not lack of regulations. On all routes/airways in E.Asia where A300 was actually deployed, a suitable diversion(i.e. airfield that can accommodate ICAO Cat D types) is always available within 60mins which is perfectly legal even under FAA or EASA regime. In fact, if U look @ a map of E.Asia, major airports are dotted all along the main airways from mainland Japan/S.Korea in the N.East, onto Okinawa/Taiwan in the middle within 2hrs, then onto Hong Kong/Philippines within 2hrs and finally reaching Borneo Malaysia/Thailand in S.E.Asia also within 2hrs. Entirely true,thanks for correcting TWs misconceptions. Looks like part I of the interview. Funniest stories of John’s career were always coming from China and India. Used to hear a lot of them while at Airbus. John Leahy is to Airbus what Murray Walker is to Formula One, he will be surely missed especially his broadside shots at Boeing. It would be great if he started a blog to keep us entertained with his views of future orders and aircraft types and provide more insights from his career at Airbus. I always thought that the term he coined for the KC46 was ugly. It detonated an unsafe aircraft configuration . I don’t think Boeing ever said any Airbus aircraft was unsafe. AFAIK, it was Northrop Grumman and its supporters that labeled the KC-767 the “Frankentanker,” not John Leahy. They’ve both been at it, although very gently. Airbus had the 4 engines 4 long haul adverts and you can buy alsorts of “if it’s not Boeing I’m not going” mugs and caps etc from the Boeing website.The engine makers go really easy on each other, knowing that it’s their turn to have a problem next time. A fascinating article. Although I believe Scott is reasonably unbiased, Leahy is not. It is appropriate to remember that this was a one-sided story, provided by a salesman-storyteller. He has been a master at his trade, which many could learn from. I’ve always been a proponent of placing an airplane or two at certain airlines to try out, like loss-leaders at a grocery store. A counterpoint to Leahy’s biased view of himself by someone like Phil Condit would be interesting. Mulally is also a good storyteller, and could provide an interesting point of view. Phil Condit is the best salesman of the two: He sold Boeing to McDonnell-Douglas! Realistically, only 2 nations on earth are still designing+manufacturing turbofans for all widebody aircrafts. The U.K. is 1 of them while no one else in Europe has a remotely similar level of propulsion tech capability. IMHO, that’s hardly an aerospace industry simply making do with whatever…. If Alan Mulally were still in charge of Ford while Bombardier was offering itself up for sale, I wonder if he would’ve taken them up on the offer that Airbus eventually got. I’m thinking you mean Boeing not Ford? I did mean Ford. I don’t know if Alan Mulally would’ve been interested, let alone been able to convince the Ford family to go along, but going with a global non-aerospace industrial giant led by the former head of Boeing’s commercial division could’ve been more appealing than being absorbed into one of the existing duopolists, from Bombardier’s point of view. Mulally strikes me as someone who likes a challenge, and he might’ve relished taking on his former company while armed with the most modern narrow body aircraft. Joke aside, apparently Boeing received the same offer and they turned it down. An ill advised move that has all the characteristics of the NIH syndrome. Still William Bushnell Stout, designer of the Ford Trimotor leveraged all the structural principles from Hugo Junkers. Boeing is the 450 pound gorilla here. I concur. But the other 450 pound gorilla is LUV better known as Southwest Airlines. We must look at cause and effect in this whole CSeries saga. What happened before Boeing sic the US Government on Bombardier? Think, Delta announced they would use the CSeries on routes in direct competition with Southwest. LUV said to Boeing: “If I’m going to buy those obese 50 year old 737s you better do something about and quick!” Rather than deal with NIH, we get to where we’re at today. Leahy shows this British kind of sardonic self reflection. Fits him in with Airbus and is completely absent in people visible from Boeing. Imagine Randy Boeing stepping back from prissy self gloss for once. will never happen. It’s a mix. Labour blames the Tories and in turn they blame Labour. But I will be frank with you Pundit, I don’t think there were many people in the UK that had any respect for the French at the time. Condescendance was rather rampant, and the Brits had a boundless sense of entitlement in those days. The Empire may have been dying but the sentiment was still very much alive. So in the 60s the UK had an Empire to restructure and their House was not in order. Therefore they agreed to Concorde under one specific condition: that no single member would be allowed to pull out without the consent of the other. The French obliged. But when the UK needed money to support other equally important programmes they wanted to terminate their participation and the French refused. But UK needed to support Rolls-Royce as well. And also the A300 competitor: the BAC Three-Eleven. And several military projects along with that. And this was all happening when Airbus was insistently knocking at the door. In those days the UK support was more than 50% on any major aerospace project. And all of these were not very successful commercially, except perhaps for the BAC 1-11, which faired better than the others. They had to choose between two horses: The United-States of Europe or the United-States of America. They bet on the wrong one. And they take no lessons from History for they are about to repeat the same mistake. I’m afraid that’s correct. It seems Germany, France & Benelux have synchronized their clocks & time is running out for the UK. UK(?) 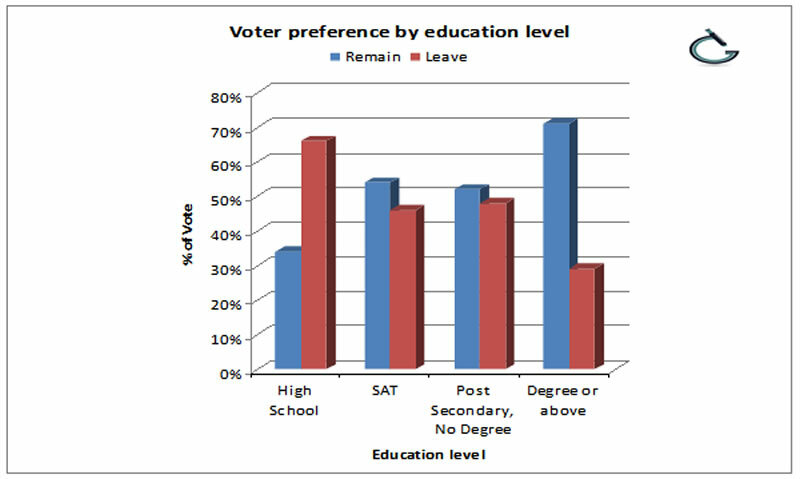 or should we say eldery + lower educated half of England except London. And no, this is not an opinion but a observation. Time is definitely running out and the EU is pushing the throttle.